The SLFP had banned its MPs, Provincial Councillors or local government members from attending pro-Mahinda Rajapaksa rallies organised by other political parties in the United People’s Freedom Alliance (UPFA) without prior approval, SLFP General Secretary MP Anura Priyadarshana Yapa said yesterday. He said that the SLFP Central Committee had prohibited elected SLFP representatives from issuing statements to media without party approval. “At present, the SLFP is in a process of bringing all its members and supporters under its banner to win future political challenges,” Yapa said, adding that statements issued by party seniors according to their whims and fancies would be detrimental to the party’s interests. He said the party had decided that all levels of SLFP public representatives should address media at press conferences at the party head office. “Hereafter, the representatives of the party cannot work according to their own agendas”, the former minister said. Yapa said that after the January 08 Presidential Election, the new office bearers of the SLFP had started the party re organisation activities to successfully face the next general election under the leadership of President Maithripala Sirisena. He said that the final aim of the new restructuring programme was to win a majority in Parliament by the SLFP led UPFA. “We ask all our members to work against conspiracies to obstruct the party mechanism and beware of such threats,” Yapa said. Sources said that the SLFP Central Committee had taken that decision because several SLFP MPs, Provincial Council members and local government members attended the Nugegoda rally on Feb. 18, demanding that former President Mahinda Rajapaksa be named the Prime Ministerial Candidate of the UPFA at the next general election. UPFA MPs Kumara Welgama, Mahinda Yapa Abeywardena, T. B. Ekanayake, Salinda Dissanayake, Vidura Wickremanayake, Gamini Lokuge, C. B. Ratnayake, Western Province Chief Minister Prasanna Ranatunga, Southern Province Fisheries Minister D. V. Upul and several other provincial council and local government members attended the Nugegoda rally after obtaining permission from SLFP General Secretary Anura Priyadarshana Yapa and UPFA General Secretary Susil Premajayantha. The next pro-Rajapaksa rally will be held in Kandy on March 06.
the slfp has been hijacked by maithripala who not only attended meetings organized by the common opposition without formally resigning from the slfp but also contested against the slfp candidate at the last presidential election. he went on to grab the power of the slfp against the will of the people. what right does he have to ban others from attending meetings organized by other parties. it seems that this the so called “good governance” they practice. those who left the party should remain with their allies where they belong. any attempt by them to distance the party from mahinda will result in a tragedy as the hearts of all slfpers are with him. the current slfp office bearers,PLEASE REMEMBER: PLEASE DONT SEND YOUR CANDIDATES TO OUR DOORSTEPS ASKING FOR VOTES UNLESS MAHINDA IS THE PRIME MINISTERIAL CANDIDATE. WE VALUE OUR COUNTRY THAN OUR PARTY! 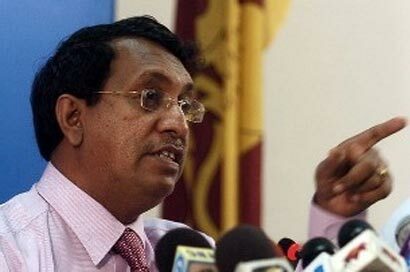 Slfp ministers why are you so foolish to bring back Mr the crook? I Blame all the slfp ministers.you watched him stealingthe poor tax payers money for nine long years! You should be ashamed. Of yourselves.if you have any decency left in you,hand in your resignation.